I’ve been taking every game as a championship opportunity, and I’m just happy we have another one coming up this Sunday with Arizona. We’ve been doing a really good job of zoning in each week, and focusing on the importance of that one game. If we continue approaching it that way, then when the real championship opportunity comes in a playoff game or the Super Bowl, we will have been preparing for it all this time, and it will be just like we’ve been there before. That really calms your mind, and when your mind is relaxed and your body follows, that’s when you play at your best. 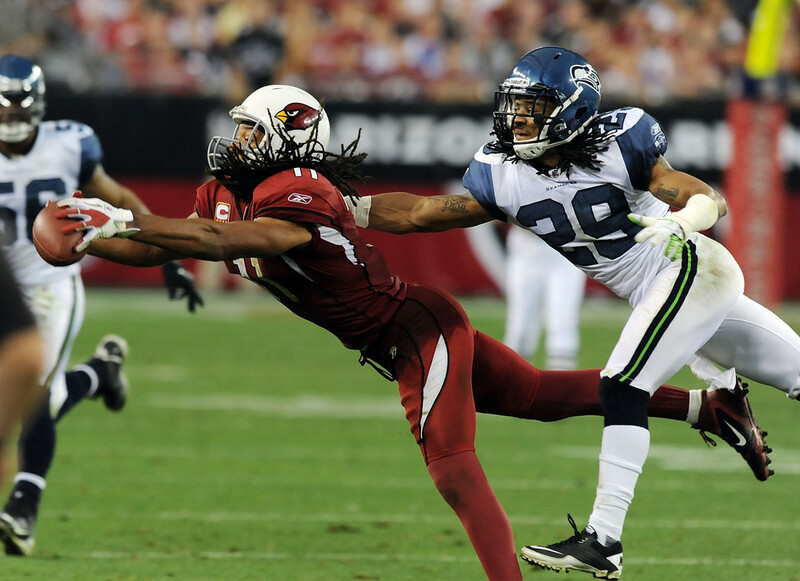 Larry Fitzgerald is a game changer for the Arizona Cardinals. (Getty Images). The great thing about this upcoming game is we’ve already faced the Cardinals this year. I always like to have a game under my belt against an opponent as far as having film, just to watch and see what happened. I look for what I did well against them the last time, and if they got any plays on me. That’s always a big help. With Carson Palmer, it’s his first year in this division, so that first game’s film will help me really understand how they will try and attack us. Their record speaks for itself. They’re 9-5 and it’s hard to win in this league, so obviously, they’re a good team. It just shows how good the NFC West has become. We definitely have to pay attention to detail because I think this could be a trap game and one we could lose if we fall asleep. Larry Fitzgerald is definitely a game changer for them, especially if he builds confidence and feels like he’s having some success. He does a great job of building on that. So we definitely have to know where he is at all times, and be ready when the ball goes up, because he has the ability to go up over two or three defenders and catch the ball. This is a great opportunity for our team to use the personnel of the teams we’re playing to raise our game. I love playing the best because that’s how you measure yourself — when you’re playing against guys like Larry Fitzgerald. But we feel very comfortable as a group, and we don’t change for anybody. We stick to who we are, and if you can beat us straight up, you deserved to win. We work on our craft going into every game so we’re very prepared and very connected to it throughout the whole week. We always feel like our chances are good, and we really feel good about the receivers we’re facing this week. Our secondary is a tight knit group. We have guys who are at the top of the game in their positions. Richard Sherman is considered the league’s best corner. Brandon Browner is up there. Kam Chancellor is considered one of the best safeties in the league. We even have guys who are developing into that like Byron Maxwell and Jeremy Lane at cornerback. These guys all look at me as a leader, and it just fills my heart. You couldn’t ask for any better honor from better guys. I think these guys are some of the most genuine people you would want to meet. People talk about Sherm and Kam as intimidating on the field, but there are two sides to every coin, and these guys are two of the goofiest guys around. They always have everybody laughing. 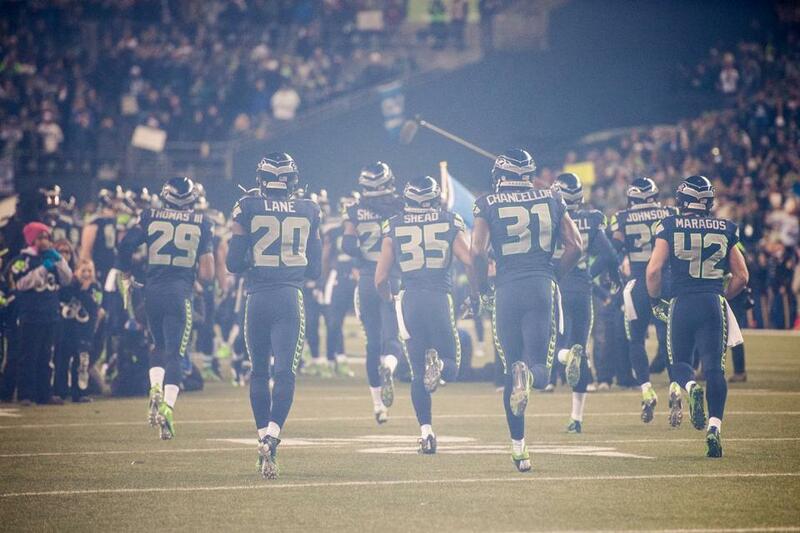 The Legion of Boom (courtesy of SeattleSeahawks.com). As a group, we just have this chemistry. We’re tight off the field, but even more so on it. So when we’re at home, and the 12th Man is shaking up the opposing offense, we don’t even have to communicate or talk to each other about the play. We just have this feel for each other. We have certain looks we give each other, maybe a hand signal or a quick movement and just read each other’s body language for the call. We’re so well connected, especially right now, that everybody knows where each other is and is going to be. My interception in last week’s game against the New York Giants is a perfect example. That play was the result of work we put in during practice. We’re all so in-tune with the game of football, we’re always coming up with ways to make the most of opportunities. We learned a lot from watching the Ravens with Ed Reed and their secondary. We saw a lot of tipped balls being capitalized on. 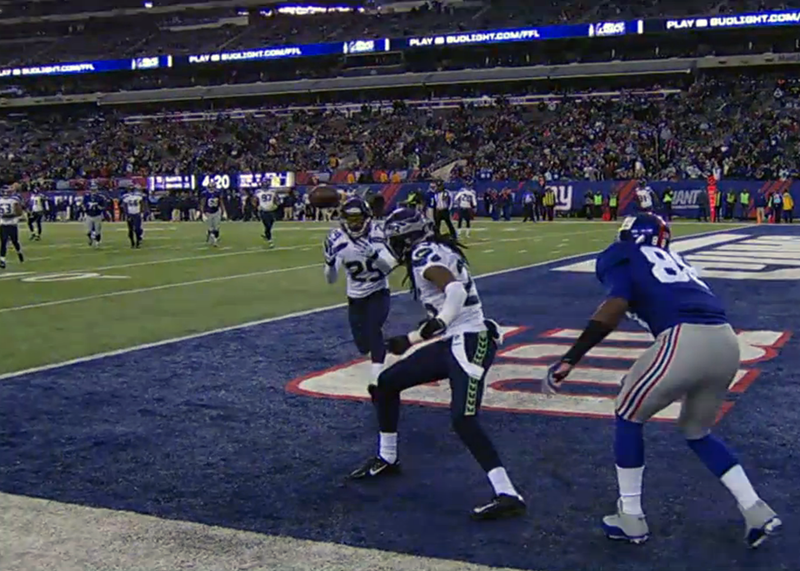 On that play, the Giants were in the red zone and tried to throw a fade ball on Sherm. We know in the league great quarterbacks always try to throw it to the pylon, and that’s what they were doing. 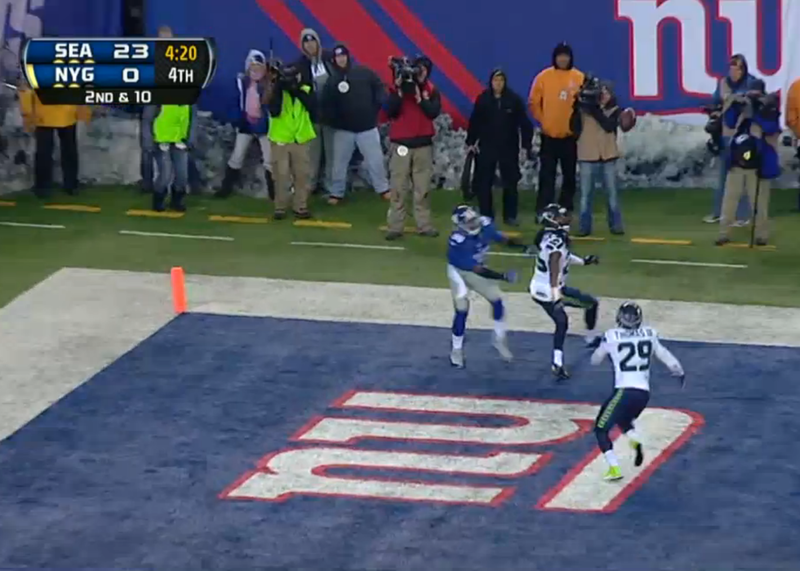 Sherm was on it, but couldn’t get into position to make a pick. I’m always telling him and the other corners: If they can’t catch it, tip it up and I’ll be there. I got a great break on it and was right there to make a pick. Then I just tried to make like a receiver, and get two feet in before going out. That is that unsaid connection I’m talking about. Before I sign off, I just want all my fans to know how dedicated I am to my craft, how much this game of football really means to me and how much I want to be the best to ever do it. Not just the best safety, but the best teammate. Thanks for reading. Fantastic write-up! Thanks for all the insight into the phenomenal teamwork against The Giants. That free safety advice bit you did downtown was awesome!! Laughed so hard I cried! Keep up the great season! Us 12s are with you all the way!! MVP!!! I just discovered a great website! Great post and well said Earl! The hard work you’ve all put in has shown us that incredible things can happen when working together. LOB has shown that not only are they a great unit, but that they are committed to our community and let me thank you for that. You will each always have the respect you deserve from this city and the 12th man. Thank you for being part of what is great in Seattle. This is a great blog, Earl. The Seahawks have the best free safety and one of the best writers in the league! Great read! The energy around the NW is incredible…. everyone is buzzing. The success you guys are having has really brought the community together. Its more than football. Keep Dominating! GO HAWKS! Thanks for the insight, Earl. I love everything Hawks, and this is another site to bookmark. I truly believe that we have the best secondary in the NFL in the LOB, and it’s great to know that with your leadership that will continue for many years to come. Always watching for #29 on the field to see what you do next. Thanks again for sharing. Love to hear it Earl! When all is said and done they will be comparing the 1985 Chicago Bears defense to the 2013 Hawks, not the other way around! Keep on imposing your will on your opponents and doing what you do. Earl, you’ve been a champ since entering the league and everything you are doing on the field is enormous. But it’s like Coach Carroll says, and you also say it perfectly: you want to be the best. Not just in football, but in life. To be the best team-mate, that’s something that can never be taken away. It’s a record that can never be broken. There is simply a group of “best team-mates” and all the rest. Either you are, or you aren’t. You’ve got everything it takes to be in the group that is. You’re already demonstrating it so well! Totally behind you, man. So proud to see you doing what you do, and becoming the best YOU that you can be! Saw you at home against the Niners and last weekend in NY/NJ against the Giants. Can’t wait to see how the rest of this season and post-season unfolds! I know you will be able to make some good reads on Palmer this Sunday…hone in and know that we love you and all of your effort! Watching you play is joyful. Awesome stuff Ear. I love watching you and the rest of the Legion of Boom play every Sunday. Not only are you guys the best in the business but us fans can tell you love doing what you are doing. I would love to see Kam do his dance. You gotta make him lose a bet! I have got to say that your dedication and preparation, as well as the entire team’s doesn’t just help the Hawks to their ultimate goal; but as a whole, the team is truly inspiring to the ordinary 12. We love you guys more than words can describe. I am grateful to be a part of the Seahawk family! GO HAWKS! This is so cool you are doing this Earl! Can’t wait to read your stuff for years to come. Favority player of all time! 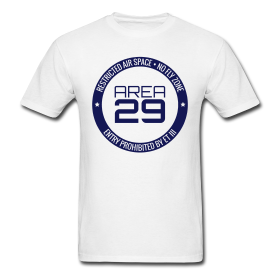 An Earl Thomas website… hurray! Will there be a “Free Safety Advice” feature in the future? Great blog, man!! Welcome to the web! I’m getting a kick out of being able to read up on the LoB’s antics and insights on football and the NFL!! You guys are the best, and it makes me proud to be a 12!!! I hope to be at either the final game of the regular season or one of the playoff games, my first trip to The CLink, ever!!! At my local tavern I’m called “THE 12th Man”, because I get all the chants going, and get the crowd into the game, just for you guys!! And every tipped ball, I’m there screaming “tip drill! TIP DRILL!! !” And this just goes to show.. I know my team, and I love what they’re doing so much that I treat every game like it’s the SB, and I spend hours every week reading up and analyzing each game because I want to be mentally there on every play (I don’t even drink during the game! LOL)! Can’t wait to see you take it to FItz this week! I have strongly considered him THE BEST WR in the NFL for years. The guy has great hands, great range, and great speed!! He’s been a consistent thorn in Seattle’s side since he came into the NFL. Be sure to not get up in the air too quickly, or he’ll beat you with his hang-time! I hope you and the guys get several INT’s early and force Arizona to consider their run game. Earl let me just say congratulations on your progression as a football player.I know you put in the time and hardwork to be sucessful.I became a Seahawk fan back in 1981 when the Seahawks selected Safety, Kenny Easley from UCLA.I’ve been through the bad years and I’ve been through the good years.I’m so happy to see this current team so sucessful.My prayer is for you all to show the rest of the world how much you all truly enjoy playing together.Free agency have destroyed a lot of championship teams in recent years due to players going for the max money.A lot of players leave sucessful teams to join other teams for the money and their careers take a nose dive. know your agents job is to get you the best deal but with team sucess comes individual sucess with endorsements that help players for the rest of their careers.Michael Jordan never held out for money and played for years making less money than rookies and other free agent players who signed for the max contracts.I hope you,Richard Sherman,Russel Wilson and Russell Okung can get together and discuss getting paid without causing the franchise to dismantle.Will less millions really hurt your family.I make less than $40,000 a year but part of my income help support the Seahawks franchise when I purchase tickets to games.You four can all play for less money at your position that will help keep the Bobby Wagners,K.J. Wrights,Malcom Smith,Cliff Avril,Michael Bennetts and other compliment players together to win Super Bowl for years to come.With team sucess you all will make millions in endorsements.Its your right to get your worth but think about all us fans who make minimum wage who still spend our money to support our favorite franchise.I hope you,Sherman,Wilson and Okung will at least get together and discuss this.Your free agent contracts can change the face of this franchise for years to come.Take care and be blessed. Go Hawks!!!!!!!!!!!!!!! Great write up. I really appreciate your taking the time to give the fans some insight into the game. It’s a blast to watch you play! Just keep doing what you are doing!!! Hope you are a seahawk throughout your whole career!! and Sherm and RW3! Thanks for taking the time to give us fans some insight, even in the middle of ther seeason. Hope to save up enough for a hawks jersey finally, and its gotta be that Wolfgrey ETIII! Btw… Lets see if Palmer can throw YOU a TD this week! Early…. I totally admire you. Thanks for including us in your thoughts. Looking forward to Sunday, as usual. Earl thank you for letting us into your world a little – I loved reading about Kam’s dance and how tight you guys are on and off the field. I’ve loved this team for a long time and I can’t tell you how special it feels to see such a great team come together. We have never won a title, not one in almost 40 years. We are all pulling for you and your teammates, thousands and thousands of us, rooting for you to end that streak and achieve the eternal: a championship. I believe. Wow – thanks so much for the article. Its awesome to read such great insight into the game and how you prepare. I’ve been a fan for over 25 years and this is the first time I’ve felt such confidence in the team and players. Keep playing the way you’ve been playing and we’ve got this. I’m in baby…GO HAWKS!! It’s a bit awkward to say, but I’m a 50-year-old man who looks at kids such as you and young Mr. Wilson as inspirations if not role models. After more than 30 years of following the.Hawks through the highs (too few) and the lows (too many), I can say without reservation that this year’s team is easily my favorite. As great as you and your teammates are as football players, I get a sense that you’re even better humans. Thank you Earl. Thank your teammates for me as well…This has been an excellent ride for the fans. I worry that the business end of football will soon ruin your team, but I continue with hope that you and the rest are all here for a very long time. Thanks for your commitment to make the most of the talent God has given you. Your insight gives those of us who are so passionate about the Hawks one more way to view the team. Keep doing what you’re doing and I hope that you remain a career Seahawk. My wife’s not the biggest Hawks fan (yet, she’s from Cali and I’m working on her) but I got her one of your jerseys because her maiden name is Thomas and she proudly wears it and cheers you on. Great website, thanks for taking the time to share. You are right the chemistry on this team shines through, as a fan all the way up in Anchorage, AK it is the highlight of our week to sit down as a family and enjoy cheering on our Hawks! We’ve seen the not so great years, but WOW this group is just fantastic both on the field and off. It’s hard to say this year that we can favor one player over another all of you give so much to each game and make it so exciting to watch. God Bless each and everyone of you for a truly wonderful season. Hope you enjoyed your recent trip to New York as I believe with all my heart you will be going back to take it all this year! GO HAWKS!!! H A W K D Y N A S T Y Y E A H ! ! ! Thanks for writing such an articulate, great article, it is fun to read about the LOB & even more fun to watch y’all play! Go Hawks! How could you not love this guy as a hawks fan? Superbly articulated insights by the NFL Defensive Player of the Year! Thanks and I’ll be back for more! Awesome, good news you have your own website. I pray you stay a Seahawk for your career. Its fun to root for high character guys like the LOB. Thanks for sharing this us, very well done. Many of us 12s consume all things Seahawks. You are the kind of player and person who makes us proud to be Hawk fans. It is allot of fun for us to be along for the ride to your trip to the hall. Go Hawks! Thanks for writing. As a fan, hearing directly from the player calms my nerves. I no longer have to worry about things like “I hope they don’t overlook their opponent”. Thanks! I’m thrilled to see not only the level of intensity that resonates from the whole club, but really the consistency of the mindset. Going 1-0 every week, treating every game as if it’s the Superbowl. It’s definitely easier said than done, but I haven’t seen anyone take their eye off the ball all season. With the 12th man behind you tomorrow and the team-wide ability to get more amped than any other team, I’m sure we’ll dominate them. I’ve listened to the side bars, interviews, mic’d clips and post-game conferences of every team we’ve faced all season and I’ve never seen any football club as energetic before, during or after a game as the Seattle Seahawks. Get it boys…..WE ALL WE NEED! I’m still waiting for that video of Kam doing that dance. 😉 Congrats to Earl, and the whole team. Super Bowl Bound baby!!! We ALL WE GOT, WE ALL WE NEED!!! We all got your back! !